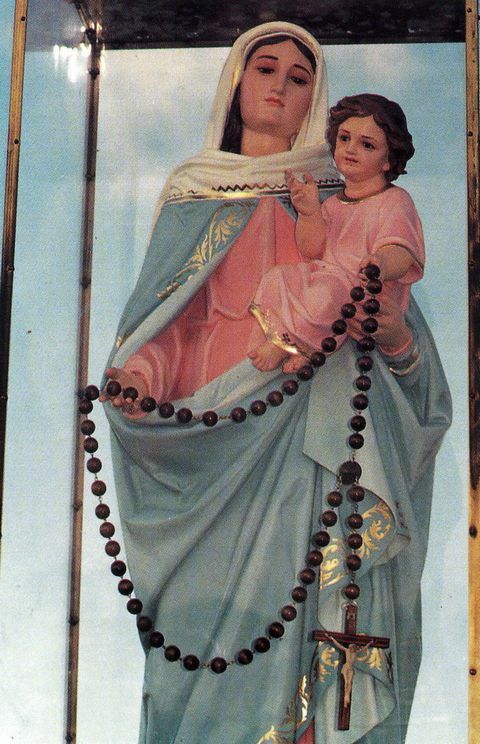 On September 25, 1983, Gladys Quiroga de Motta (46) was thinking about the approaching spring weather when she noticed her rosary beads were “glowing like molten steel.” Immediately, she ran to get her neighbors to come see — and they saw the glowing rosary, also! Word spread, and many groups started praying the Rosary daily. As Gladys knelt privately one day in her bedroom to pray, the Blessed Virgin was instantly in front of her. Madonna’s face was radiant and beautiful — her whole figure was glowing with light. She wore a blue gown and veil. 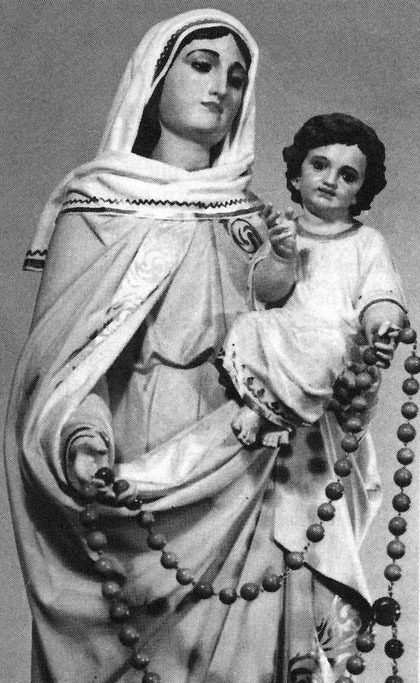 In her arms was the baby Jesus and a large rosary. Mary only smiled at her, never speaking. And then, as suddenly as she had appeared, she vanished. Gladys was stunned, thrilled, and making sure that she was really wide awake. As the silent apparitions continued over several weeks, it was the sixth visit on October 13, 1983, when Mary finally spoke to Gladys. 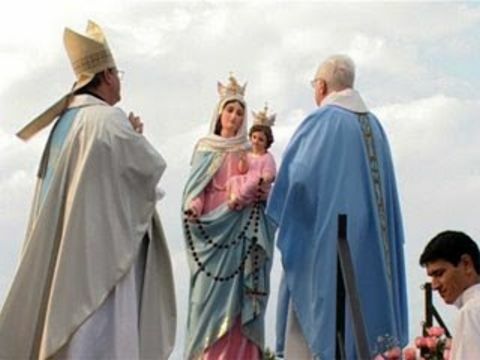 Our Lady was requesting that a church be built. On the evening of November 24, Gladys and a small group had walked to the location where Mary had stated that she wanted a church. As they stood there, a powerful shaft of light pierced the darkness and struck the soil. The only other witness to this in the group was a 9 year old girl. The significance of this passage is that it contains the instructions given by God to the Israelites for building the Ark of the Covenant by means of which Yahweh would be present to them. The New Testament and the early Church had consistently understood Mary to be the New Ark of the Covenant, who was the dwelling place of the Holy Spirit and the Bearer of the Son. The Virgin was restating this ancient teaching. By May 25, 1986, the medal that Mary had described had finally been created, produced, and was now being spread into circulation — just as the Virgin had requested. 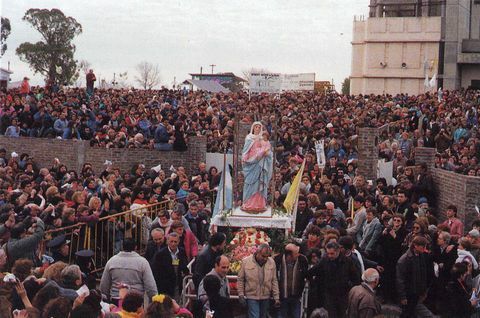 On April 11, 1987, Bishop Castagna meets again with Pope John Paul II and promises that he will direct a study of the phenomenon happening in San Nicolas, Argentina. October 13, 1987 – The building of the church sanctuary (that Mary desired) begins. News of a miracle healing of a 7 year-old boy on his deathbed detailed how his pregnant mother’s desperate prayers were answered. His paralysis ceased and an egg-shaped brain tumor began shrinking away to nothing over 3 weeks. He had been given his first Communion moments before his healing began. The messages and visits ended on February 11, 1990. 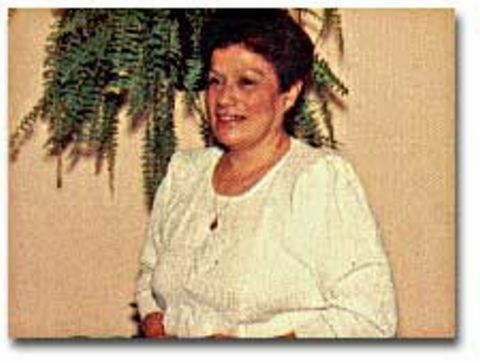 A commission of priests, psychologists, scholarly theologians, and psychiatrists declared that Gladys and her messages were authentic, the healings were both supernatural and real, and her mental state was balanced, healthy, and free of hallucinations. Bishop Castagna approved the apparitions and began accompanying a monthly procession on the 25th of each month, often accompanied by as many as 100,000 people. 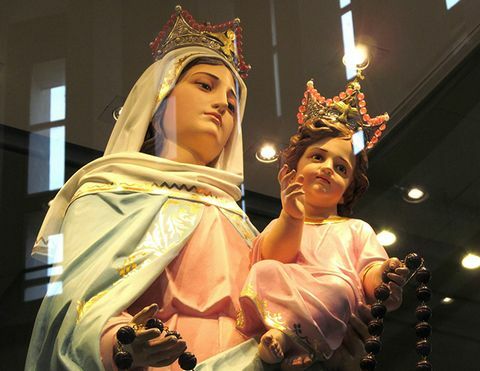 In 2008, a magnificent new church was completed on the 25th anniversary of the first apparition, and 200,000 people attended and passed through it within 24 hours to see it and its new wooden statue of Our Lady of the Rosary. Previous PostLuzon, Philippines, 1982Next PostOur Lady of Betania, Venezuela, 1976-1990.